The Caoling Historic Trail connects Gongliao to Dali on the northeastern part of Taiwan. It was initially constructed in year 1807 to serve as an important transport link between the capital city of Taipei and Yilan. At the time, the only other connection between the two cities was to travel by sea. Now, it has come to be a destination for hikers and tourists. The trail is about 8.5 kilometers long and will take about three to four hours to complete depending on your level of fitness. The hiking trail has a relatively low difficulty that can easily be completed by non-hikers with a steady pace. 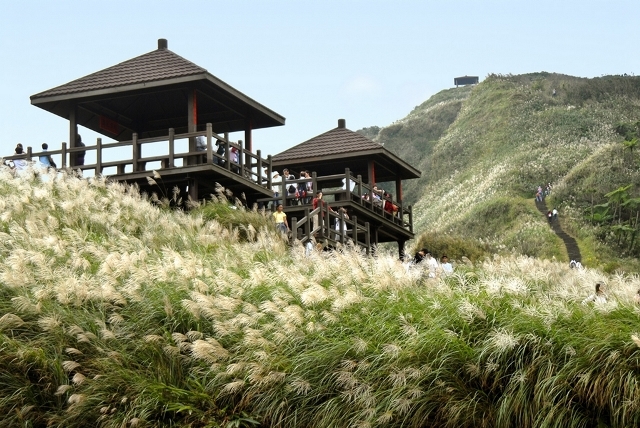 The hike starts at the Fude Temple found in Yuanwangkeng and passes both counties of Yilan and Taipei and several historical sites on the way. Among these are two Qing Dynasty stone inscriptions: one will translate to “Bravely Suppress the Wild Mists” while the other shows the single Chinese character for “Tiger”, which is believed to control the winds. Both large boulders were ordered by the Taiwanese regional commander of the Imperial Forces. It was meant to keep off the spiteful forces of nature in this formerly entirely remote area. Another attraction is the Tiangong Temple found on the Caoling Mountain in Dali. The temple is known to have ornately carved pillars and beams that look out into the Pacific Ocean. Because of the abundance of historical sites found along the trail, the Caoling Trail was then known to be the Caoling Historic Trail instead. The scenery of the trail changes along with the tree-line sections until it opens to an expansive view of the sea and ends in lush greeneries and terraced fields. Once completed, the end of the trail rewards you with a spectacular view of the country’s northeastern coast at the Beiguan Tidal Park, which is one of the most scenic spots of Lanyang. The coastal geology of the tidal park is formed by cuesta formations and tofu rocks that form a dramatic scene along with the continuously pounding of the ocean waves. The trail is especially spectacular during the fall season where endless files of grass sway with the gentle breeze. To reach the hiking trail, catch a train to Gongliao and follow the ridge of the passage along the Taoyuen Valley Trail. To get back to the capital city, catch a train from Dali which stands as your destination point. You can also choose to get off the train at Dali and make your way to Gongliao instead. There are no shops along the extension of the trail so hikers should pack their own food during the trip. There are however several restaurants that sell fresh seafood in the nearby surrounding towns of Gongliao, Dali and Fulong. The Taiwan Lonely Planet Guide suggests that if you’re left with only one hike during your stay in Taiwan, the Caoling Historic trail must be on top of your list. With valuable historical remains and magnificent natural resources, the historical trail is but a vivid testimony to the pioneer spirits of the country’s ancestors.